We’ll always have Paris? Not in Worcester, we won’t. The old Paris Cinema saw the end credits roll 11 years ago, and now the building itself has bowed out of downtown. Demolition crews arrived on Franklin Street last week to make way for a beer garden on that spot. One thing that hasn’t changed: There’s still no full-time movie theater downtown. The Brew Garden will be a huge plus, bringing diners and other diversion-seekers to an airy, attractive space. But the Paris Cinema — and Showcase Cinemas (which closed 19 years ago), the Bijou Cinema (13 years gone), and predecessors — had the right idea in their heydays. Movies have an enduring draw as an easy, casual entertainment destination. We would love to see a reputable, family-friendly movie theater return to the downtown area. It needn’t be a huge cineplex such as seen in suburbs everywhere. In fact, a quirky space dedicated to movie-showing could be just the ticket to help move along the storyline of Worcester’s downtown remake. Millbury’s Elm Draught House Cinema, Clinton’s Strand Theatre and Cambridge’s Brattle Theatre are examples of popular, comfortable and unconventional places for catching a feature film. Such unique movie houses can be fairly small and housed in vintage surroundings, and still draw loyal audiences, particularly if they are accessible and can be repurposed at times for talks, meetings and other community gatherings. 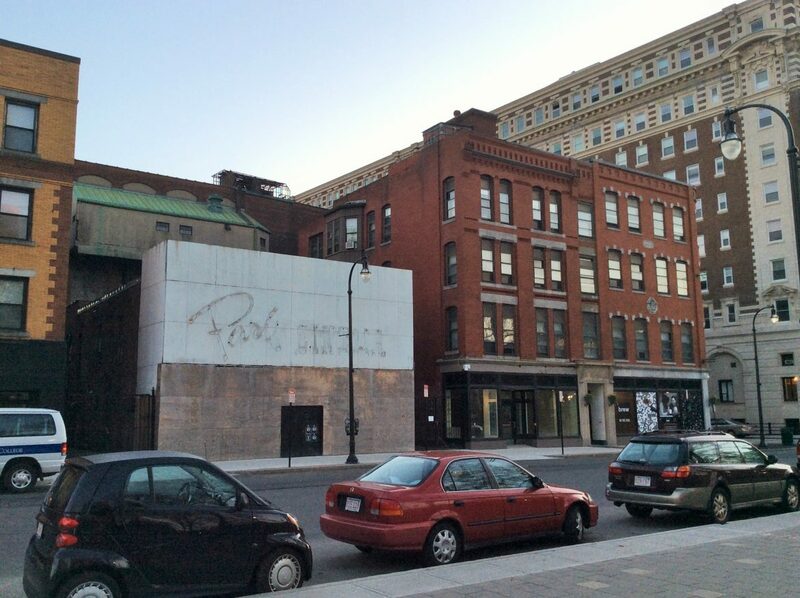 A think-outside-the-box developer might be able to see the possibilities in some venerable old dead spot downtown. In the right hands, part of Memorial Auditorium could even be cast in this role. Is it time Worcester went back to the future? An old-fashioned movie venue would complement the housing, hotels, restaurants, office space and other destinations reshaping the city’s core. We welcome the return of Movies on the Common for summer, but it isn’t enough. Eventually, the city’s “new” downtown is going to need year-round, old-time, Hollywood-type entertainment. And once we get that, we’re going to ask for ice cream nearby. Or at least frozen yogurt. The demise of the Paris Cinema, meanwhile, removes an unsavory element that had been too prominent for too long near Worcester Common. Once known as Capitol Theatre and a distinctive place to see a stage show, it changed its name and became a movie theater in 1965. But in 1982, the Paris Cinema, with its huge iconic sign — the blue “i” in “Paris” dotted with a red star — turned into an adult-movie palace and began its descent. Thinking back over the building’s bright beginning and long history, the removal now of the long-empty blight is in some ways sad. But it’s certainly a necessary step in the evolution of our city. We won’t miss the Paris — but we do miss movies downtown.